Sunday marks the end of the smelt season at Baker’s Smelt Camp in Pittston — just three days before the U.S. Coast Guard is expected to start its second ice-breaking mission on the Kennebec River this year. But camp owner Richard Potter said Friday he’s not sure whether the cutters will be able to make much headway. “We still have 32 inches down here,” Potter said. Out in the channel of the river, he said, the ice is about 22 inches thick. With the ice breakers coming up the river again, Potter said he doubts the river will refreeze, and he’ll be pulling his 30 shacks from the river, as he did in mid-January when the ice jam moved through and at the end of the month when the ice breakers made their first trip up the river. This time, he’s be storing them for the season, which is ending a few weeks earlier than usual. “We probably could have stayed out till the 5th or the 10th (of March), but it’s not worth taking the chance,” he said. Even as Potter is making plans to end his season, the Coast Guard coordinated with federal, state and local agencies Friday via conference call to work out the logistics of its plan to break the ice next week on the Kennebec and Penobscot rivers. 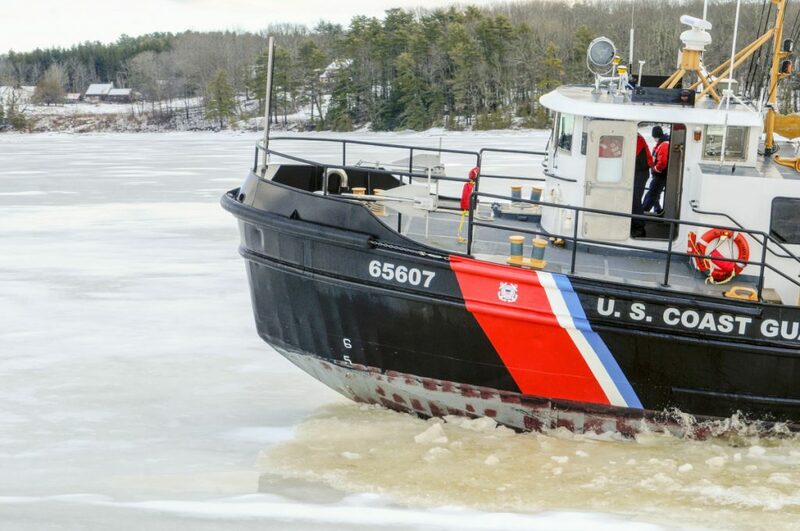 The USCGC Shackle, deployed for assessment on the river, broke some ice on Thursday. The crew reported Friday that south of Chops Point in Woolwich the water was clearing well. The tug progressed as far as Abagadasset Point in Bowdoinham before it lost the tide and had to turn back, but the crew noted signs that the river ice starting to degrade and rot and slabs of ice are starting to break free and flow downriver, as well as stretches of open water. That’s a good sign, Kennebec County Emergency Management Director Sean Goodwin said Friday morning. 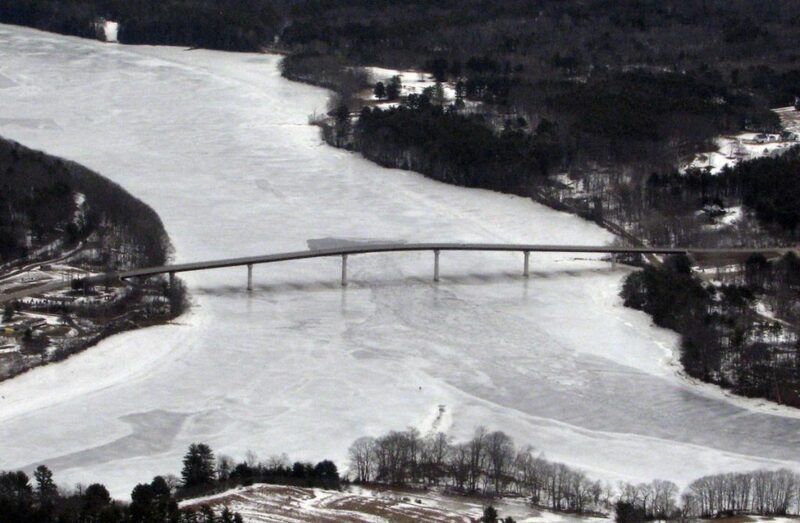 Before sending the 140-foot ice breaker north of Richmond, the Coast Guard has asked the U.S. Geological Survey to make ice measurements just north of the Maine Kennebec Bridge, which connects Richmond and Dresden, and just south of Gardiner. The ice on that stretch of the river has been undisturbed this winter. That will help determine how long the ice-breaking operation might take. An aerial survey by the Coast Guard shows where its larger ice-breaking ship reached in January before the operation was suspended. But north of Richmond the ice appears more solid. Goodwin said Friday he plans to visit Worthing’s Smelt Camp in Randolph and Baker’s to let them know about the pending ice breaking operation so they can pull in their shacks. He said he also plans to contact Foggy Bottom, the campground and marina Farmingdale. While it is closed and has nothing in the water now, it has equipment near the riverbank, he said. At Baker’s in Pittston, Potter said winters seem to run in cycles. In 2008, they had to pull the shacks off the ice a couple of times. Last year was great for smelt fishing, but the year before was the first time in 40 years they didn’t put out the camps. Record-breaking warm weather Wednesday brought melting of ice and snow, but no new concerns about flooding in the Kennebec River. Officials in communities along the river have been monitoring an ice jam between Hallowell and Farmingdale that formed about six weeks ago, when a brief warm-up and heavy rainfall loosened the river ice and sent chunks and slabs of it downstream, where it’s been lodged ever since. The destructive jam flooded a stretch of downtown Hallowell, stranded cars in the rising water and prompted Augusta officials to close off Front Street in that city to parking until the flooding threat abated. 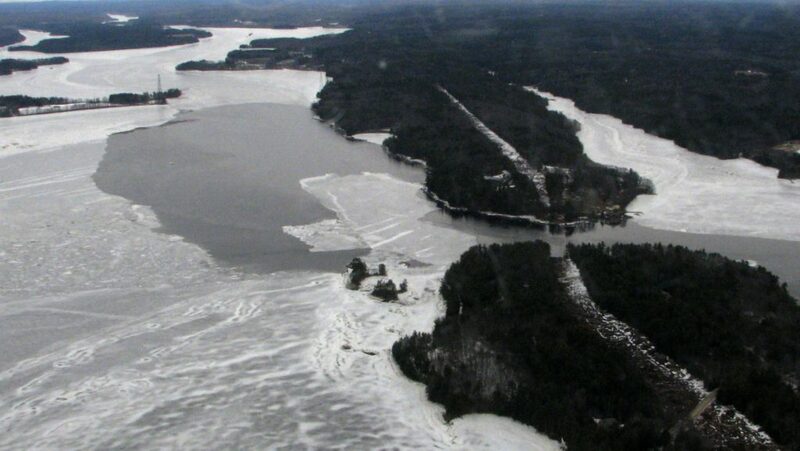 The ice jam also prompted the unprecedented request to the U.S. Coast Guard to launch an early ice-breaking operation at the end of January. That effort was called off at Richmond because the ice was too thick for the ships to break.